The BEST Vegan Pie Crust. Just four ingredients to make flaky crusts of your dreams. Burrito Boy has been asking me to make him pie all summer long. When I had that huge influx of blueberries, he floated the idea of me making some pie, but I simply couldn’t be bothered with pie dough. My “new” food processor that came as an attachment with my blender was awful and would never process things evenly. (By new, I mean it’s maybe 2 years newer than my “old” food processor, but my “old” one worked loads better than the “new” one). Luckily, this past weekend I got my trusty “old” food processor back and OH HOW I MISSED IT. I didn’t even care about lugging it on the 50 minute subway ride home, I was just so happy to have it back in my kitchen. As soon as I got it back, Burrito Boy and I fired up our cameras to start filming something for our YouTube channel. That’s right, folks, TVV is going to be on YouTube. As of the day of this publishing, there is absolutely nothing on it and I have a grand total of ZERO subscribers, but hopefully that will change very soon. Somehow, I lucked out completely and connected with a guy who also happens to work in TV production, so he has a very firm grasp of lighting, camera, and film editing. A food blogger’s dream come true, right? We could be a dynamic blogging duo, like White on Rice Couple or Minimalist Baker. I have a vision for us to have a production company for food videos and photography. I’M LIVING THE DREAM. One of the many fun things about new relationships is finding common ground. Believe it or not, Burrito Boy is the first person I’ve dated who’s interested in about 80% of the same things I’m interested in. Perhaps more. We already established that he’s a Trekkie like me and that he works with cameras and lights for a living (huzzah like yours truly). We both feel the same about drugs (no thank you), drinking (I’d rather drink water), parties (only on occasion), crowds (only if I have to), and we have a surprising amount of common music tastes. From Harry Potter to Pokemon, or Game of Thrones to Heroes—we have a never-ending list of shows and movies that we want to watch together. All this time spent on hanging out and doing the things we like, it doesn’t leave me a lot of time to make all these summer fruit pies he’s been asking for. So we opted to make a video for it instead. Currently, all the video files are sitting on his laptop at home since he hasn’t had a chance to edit them yet. In the meantime, I’m in Arizona for the next few days on an exciting farm tour with Natural Delights Medjool Dates! While I’m away, have a ball with this pie crust recipe. With the holidays coming up, there will be many pies to be made! Pumpkin pie, lemon meringue pie, pecan pie…Oh pie. And you know what else is awesome? Burrito Boy and I are both on Team Pie. Sometimes we like to switch over to Team Cake, but we’re aaaallll about that pie. With only four ingredients, this pie crust can be used for quiches, pot pies, or other savoury applications, while also being perfect for a sweet, fruit filling, a top layer of crust, and a dazzling sprinkle of sugar on top. Hopefully Burrito Boy will have the videos edited by next week and we can share it with you folks on the YouTube channel. While you wait patiently, you should also be awesome and just hit that subscribe button on this Youtube Channel in case you didn’t feel like searching around to find me. So subscribe, made some pie crust, and with the scraps, roll them out and then cut them into fun shapes! 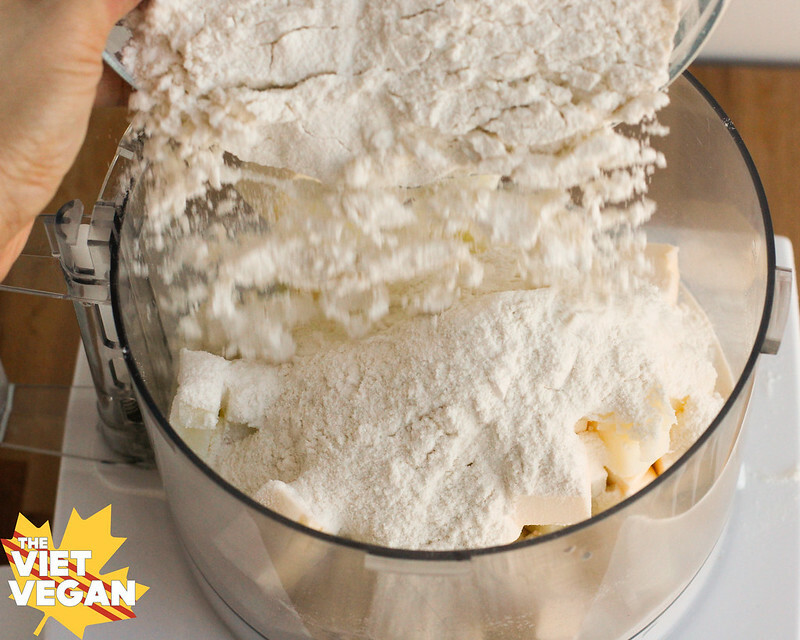 Sprinkle with a little sugar and cinnamon, and you’ve got yourself some delicious pie crust cookies! Yum. I’m off to Arizona, I’ll see you folks in a few days! Stay tuned to my social media as I explore Yuma, Arizona and check out the date menu and date farms. Roughly cut the buttery sticks into 1/2 inch cubes. 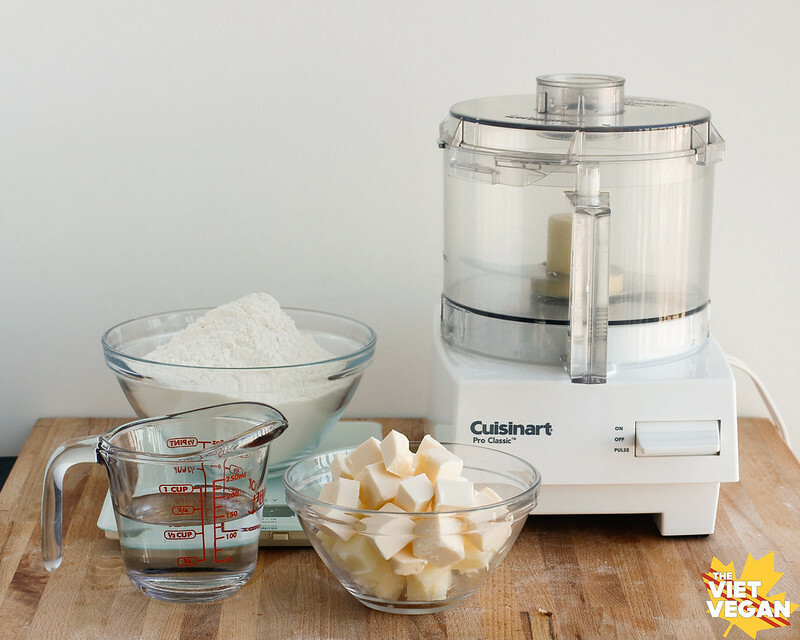 Add to a food processor with the flour, sugar and salt, and process until you only have pea-sized chunks of butter. Add the ice cold water and process until a dough forms. 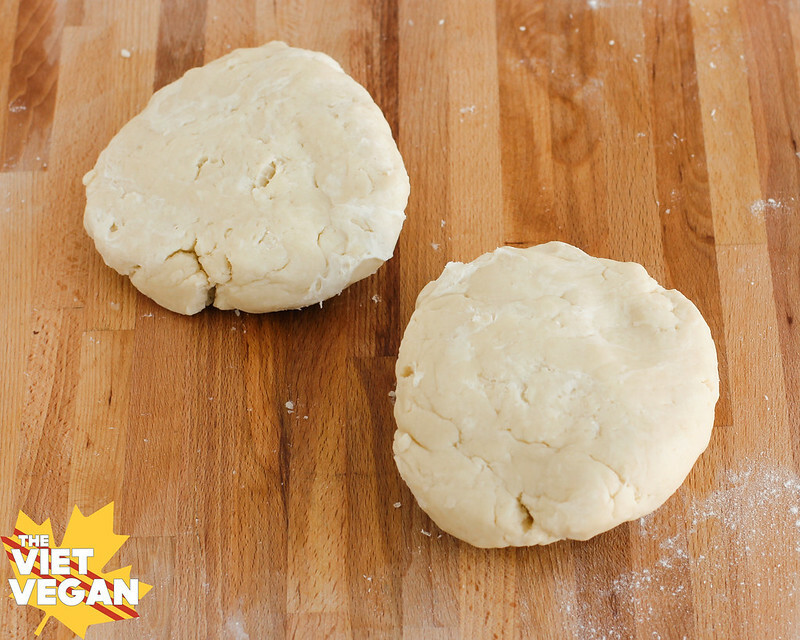 Turn dough over onto a clean working surface. Divide into two equal parts and gather the dough, forming to flattened discs. Cover in plastic wrap and refrigerate for at least an hour to let the gluten in the dough relax. 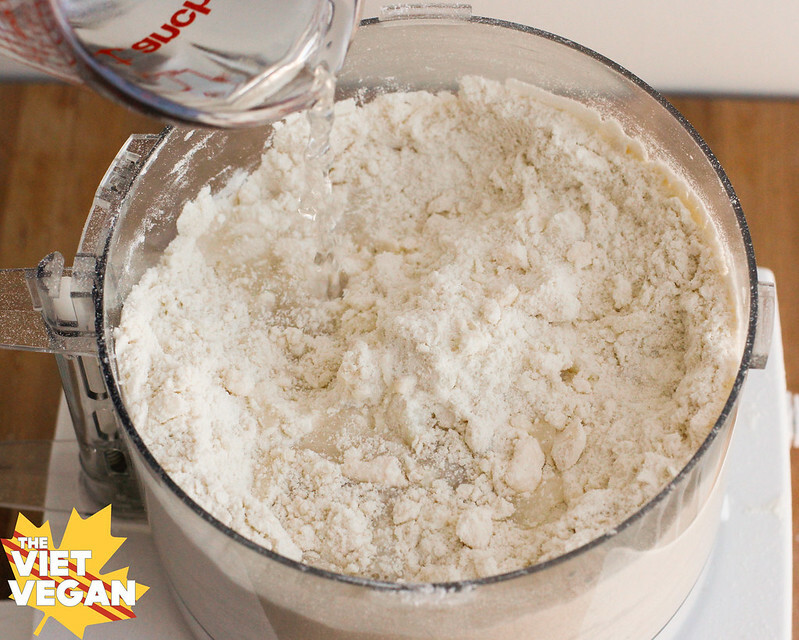 To use the dough, remove from fridge and roll out on a lightly floured surface. Cut into shapes, use as a pie crust, or make smaller hand pies! It's a versatile pie crust that can be used for both sweet and savoury applications. Haha thanks Becca! I now have a grand total of 3 subscribers!! Yay! Nothing like two weirdos finding each other, right? I hope BB and I can be as weird and happily together as you and Don =) And I appreciate you making the effort! You've always been very supportive of my blog (via all the various SM channels through which I shill this little corner of the internet), so thank you Brenda, for sticking around. You're one of the few people I still sort of keep in touch with since uni haha. Hey Lisa,Do you think I can replace the Earth Balance shortening with another stick of butter? or any other suggestions?Thanks a lot! Hi Ben!Yes another stick of the buttery Earth Balance works just fine :) I edited the recipe since the shortening sticks were discontinued. Oh my goshhhh, this crust was amazing! Made it for Thanksgiving and it was perfecty crispy and soft, flaky, and it had no cracks at the bottom after I baked it. I'm going to try them out as cookies this Christmas!! Hi. Thanks for your lovely video 😁 I have never had a chance to try a pumpkin pie because I am in NZ and it is just not a thing here, but I would like to try it. Do you think I could use coconut oil instead of the butter alternative? It is pretty cool/cold where I live so it's a solid at room temperature. You could try it but it might not have the same flavour? Let me know how it works if you try it! Nourah, have you tried the crust with coconut oil yet? I'm so curious about whether or not it worked well! I live in Oman and we don't have plant butters here either. How would you pre-bake this pie crust? I just made a single, blind-baked crust using your recipe for a fresh strawberry pie and it was amazing! So flaky and crunchy and delicious. Thanks so much for sharing. I've been trying to find the perfect vegan pie crust recipe and I'm glad my search is finally over. Going to try this today but as I do not have a food processor I will mix by hand. I hope i don’t overwork the dough by this method! Just made these with Miyokos vegan butter and molded them in muffin tins for mini apple pies with lattice tops and it turned out beautiful and sure was a hit at Thanksgiving. Thank you so much. Hello! i made this pie crust today and im worried its a bit too soft. it has been in the fridge for hours now and still seems floppy. should i add more flour to it? i think when i mixed everything together the butter might've been too soft. what do you suggest? thanks! Hi! If it's too soft then yes, add a touch more flour :) What kind of butter did you use? Did you measure by weight? Maybe I'm just ignorant but I measured 8 ounces of butter by weight because I didn't have it in stick form.I thought that it looked like a lot of butter. Well obviously it is 8 fluid ounces and closer to 4 ounces by weight. Now i have 4 crusts instead of two. Hi Dale, not sure what kind of vegan butter you're using but I measure by weight as well, and I've used the Earth Balance from the tub as well. Just wanted to comment for anyone that might be interested: I made the pie crust with (soft) margarine, which is all we have available as vegan butter in the part of France I live in. The dough was very soft, and it ended up a bit crumbly and not very sturdy when baked, but still delicious! Would definitely recommend. That's helpful to know, thanks Laura! You might want to split the ratio of full margarine to part margarine part coconut oil? The cold coconut oil might be more firm in the end, but I'm not sure. I will definitely try something like that next time. Maybe half/half or 2 third/1 third! I'll make sure to drop another comment if it makes a big difference. Thank you!